Trabzonspor fans have been protesting in support of a player who was sent off for showing a red card to a referee. 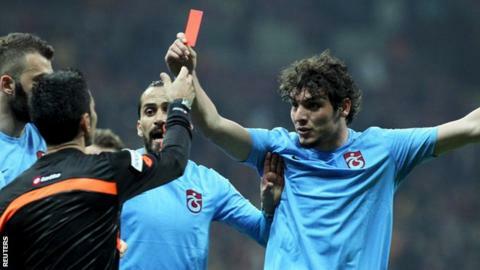 Salih Dursun held up a red card to referee Deniz Bitnel to become the fourth Trabzonspor player to be sent off in a 2-1 defeat at Galatasaray. However, he has received support for his gesture - while Bitnel has been criticised for his performance. Trabzonspor have also started selling T-shirts in their official shop showing Dursun making the gesture. There have also been reports that local officials in the Macka district of Trabzon thought about erecting a statue in honour of the player's action. And, while some of the club's supporters held up red cards as they marched through Trabzon, supporters in the western region of Kocaeli have reportedly lodged a criminal complaint against the referee for "abuse of power" and "inciting hatred". Tranzonspor were already down to nine men with the score at 1-1 when referee Bitnel red-carded Luis Cavanda for a foul and awarded Galatasaray a penalty. In the ensuing remonstrations by the visitors, the red card dropped to the ground, with Dursun picking it up and waving it at the official, who in return held it up to the player as he sent him off as well. Trabzonspor chairman Muharrem Usta said: "There are messages from all over Turkey, saying 'we are ashamed'. "Salih Dursun showed the red card to Turkish football. This is not a symbol of rebellion. It is a symbol of rebirth." The head of Turkey's central referees' commission, Kuddusi Muftuoglu, conceded: "We share the disappointment of Trabzonspor. "We reward successful referees and take measures against unsuccessful ones."